On hot days like we’ve been experiencing up in New England these past weeks, you couldn’t get me to touch an oven with a 10 foot pole. Oh man, forget about it. Now that I’ve moved all of my things into the apartment with Mr. E (not a small feat), we’ve instituted the become more active in our own kitchen initiative. To combat some of the all American goodies we had our fill of during the July 4th long weekend, we made a fresh salad. I rarely crave salads. You should hear me complain about having to eat salads for lunch at work. My poor coworkers hear it everyday. However, in those rare instances, I’m yearning for that refreshing cool crisp greens have to offer, especially when they’re mixed greens like this salad. Endive and arugula lend gentle bitterness and assertive pepper flavors to a punchy zing of citrus. In a small bowl, whisk together the orange juice, vinegar, mustard and oil until thickened and fully combined. Season with salt and pepper. Refrigerate until ready to serve. 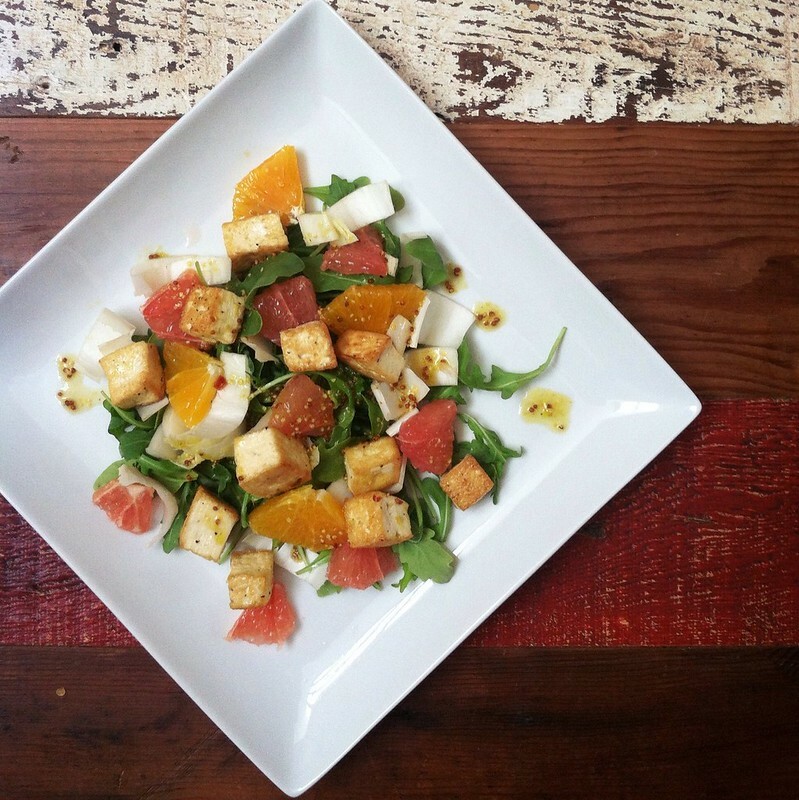 In a large bowl, combine arugula, orange, grapefruit, endive and tofu. Toss with dressing and serve.